Another stationery shop in Vancouver, BC that Mr. Three Staples and I were lucky enough to visit was The Regional Assembly of Text. What a wonderful store! If we hadn’t been on such a tight schedule, we definitely would have spent more than just half an hour here. The store was easy to shop, with neatly laid out tabletops and displays. I particularly liked seeing typewriters, peg boards, and old-school chairs as part of their decor. 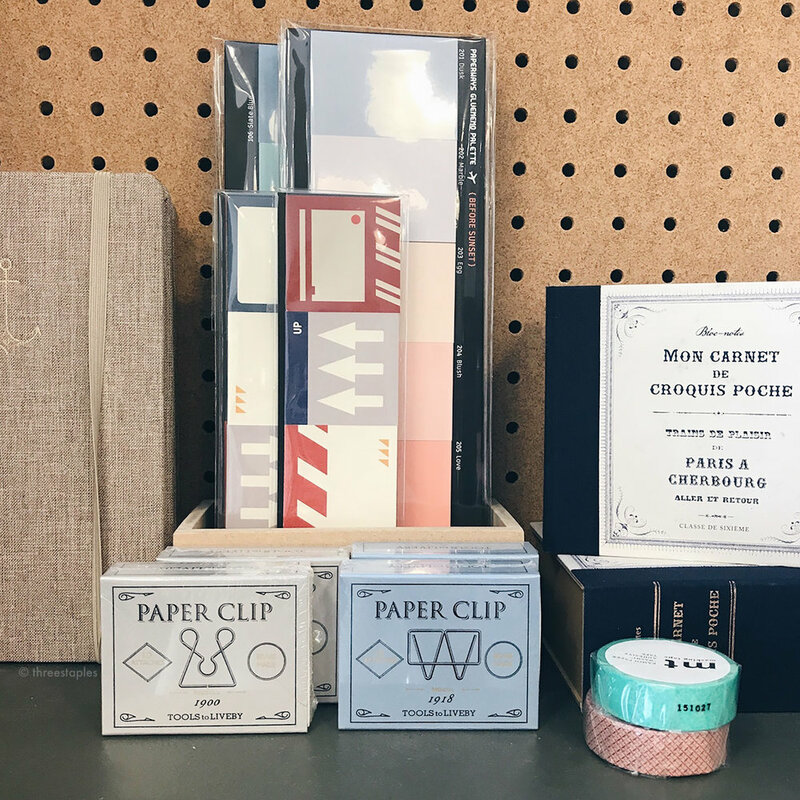 In terms of merchandise, they had lots of journals, notebooks, desk accessories, and gifts, many of them designed and made in-house. Overall, it reminded me a bit of The Curiosity Shoppe and Little Otsu when they were still here in San Francisco. I loved seeing pens and pencils in glass jars throughout the store. Pilot Hi-Tec-Cs spotted! Fun buttons and patches! I hear they also run a Letter Writing Club every month. If I lived in Vancouver, I’d totally participate. And I’d hang out in their Lowercase Reading Room, where you can find lots of zines and self-published books. I was happy to come across some familiar but hard to find brands here, like Paperways, Tools to Liveby, and mt. I had a lot of fun browsing their house-made notepads, journals, rulers, greeting cards, etc.. So many! I had to walk away, but their postcards I couldn’t resist (see next photo). Sticky notes and peach notebook by Paperways, mini letterpressed note pad by Bison Bookbinding & Letterpress, various postcards by The Regional Assembly of Text, and graph grid notebook with color pencils on the cover by Cavallini Papers & Co.
Hopefully, this won’t be the last time we visit Vancouver. The Regional Assembly of Text was too cute not to go back. Thanks to Rob for the recommendation! Recently, Mr. Three Staples and I made a short trip to Vancouver, BC, Canada, and here I'd like to show you some photos from our favorite spot, Paper-Ya. This wasn’t the first time we visited this stationery store, and we’re happy to report we still love it! It’s on Granville Island, with plenty of other small stores nearby to browse (not to mention a public food market!). 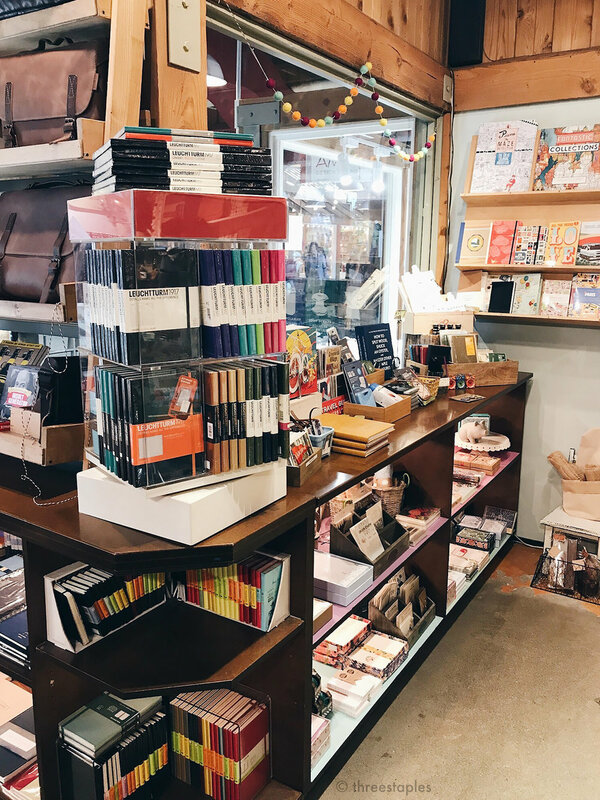 I’d say their vibe is similar to Paper Source here in the US; their selection is a mix of both Western and Japanese stationery brands, sort of like Maido or Kinokuniya. True to its name (ya in Paper-Ya means “store” in Japanese), they have large, loose sheets of papers in a variety of textures, as well as wrapping papers and tons of notebooks and journals. It’s a small-ish store packed with stuff, but the space is well laid out and easy to navigate. Lots of notebooks in a range of styles, from serious to whimsical. We first fell in love with Paper-Ya because they carried some Japanese brands not often found in our local stores, like Delfonics and Hightide. We were happy to see them again this time. Actually, that was the main goal of our visit: to stock up on Delfonics Rollbahn spiral notebooks (I wrote in depth about them here). At $8.95 CAD each, they were still a bit pricey, but we figured with the current exchange rate, it was a lot better than paying the US retail price ($15 USD at East Dane, for example). We bought mostly the L size (comparable to B6 size) but they had a variety of other sizes. Side note: they also had Midori MD Paper notebooks and Traveler's Notebooks. I almost bought this unusually-sized Hightide Penco notebook. Japan-made double-ring spiral notebook with American-style innards? I'm not sure if they had fountain pen inks prominently displayed like this before, but I was happy to see many this time, including Kyoto TAG and J. Herbin inks. I also had fun looking at sealing wax sticks and seal stamps. My first time seeing Kyoto TAG ink bottles in person. I just admired them and didn’t buy any. I found a hidden dog! Palomino Blackwings, Forest Choice carpenter pencils, Delfonics pens and pencils, erasers, etc. Field Notes spotted! They were well-stocked on the latest limited editions, from Sweet Tooth to Campfire, as well as non-limited editions like Expedition, Flight Log, Cherry Graph, and Pitch Black (new version). I believe each 3-pack was $19.50 CAD? Lots of gift items, like these Canada-themed notebooks and patches. A very large selection mt brand washi tapes. I don’t know how I resisted but none of them came home with me. Caran d’Ache pens. I don’t have a picture of it but they had another glass case with other fountain pens like Lamy and Kaweco. How cute is this garland made with red origami maple leaves? Did we get enough Rollbahns? If you have a chance to visit Vancouver, we highly recommend Paper-Ya. It’s the sort of shop we wish was in our neighborhood.